I recently threw a "Mustache Bash" Baby Shower for my friend Jennie and her baby boy Hudson. 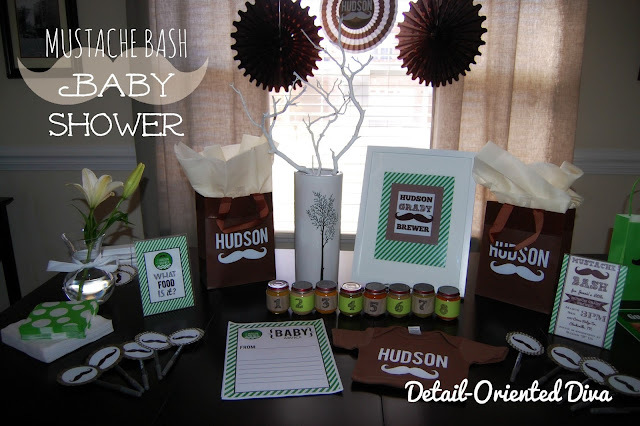 I kept it in the color scheme of browns and greens, since those were the colors of her nursery. I pretty much put mustaches on just about everything. 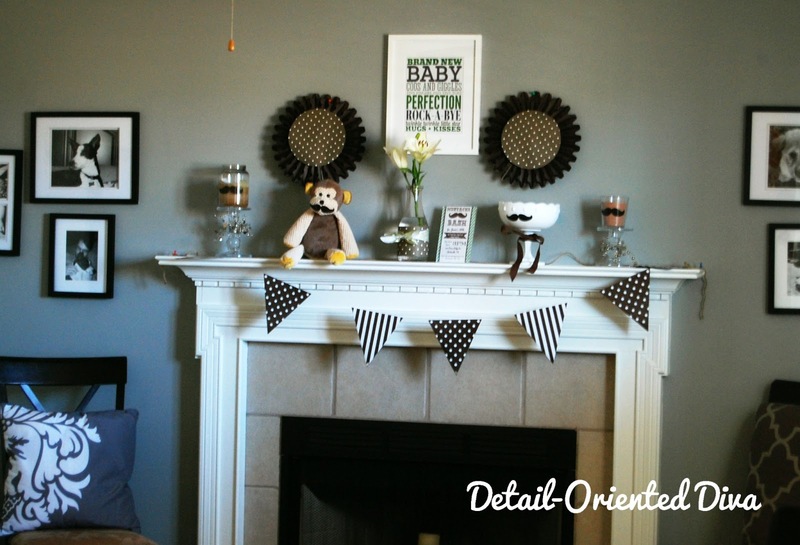 I designed a few printables that she could use for nursery decor later. 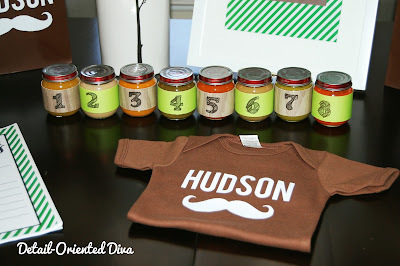 The baby food jars were for a food guessing game which was super fun! I used the gift bags to house the prizes for the game winners. I made up a little baby advice form for all the guests to fill out. I figured she could keep these for Hudson's baby book. Some of them were quite hilarious. Here's another close-up shot of some of the table. Did you catch the cute mustache onesie I made? Pretty flowers and personalized game signs. Here is the view of the mantel. 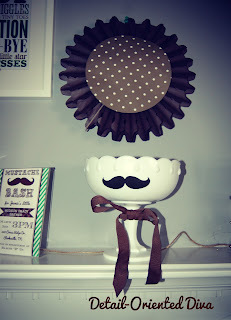 I just added mustache stickers to dress up some of my candles and decor. I borrowed The Kiddo's monkey and dressed it up with a stache as well. Accordion fans and bunting from Oriental Trading Company for super-cheap! I just added some scrapbook paper circles on the front of the fans to dress them up. This other pattern of fan is also from Oriental Trading. 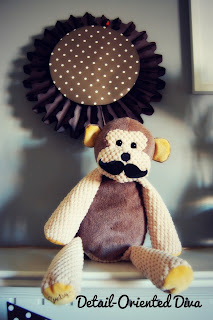 I just added the circle with name and mustache. 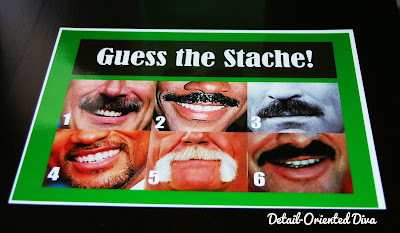 We played the "Guess the Stache" game. 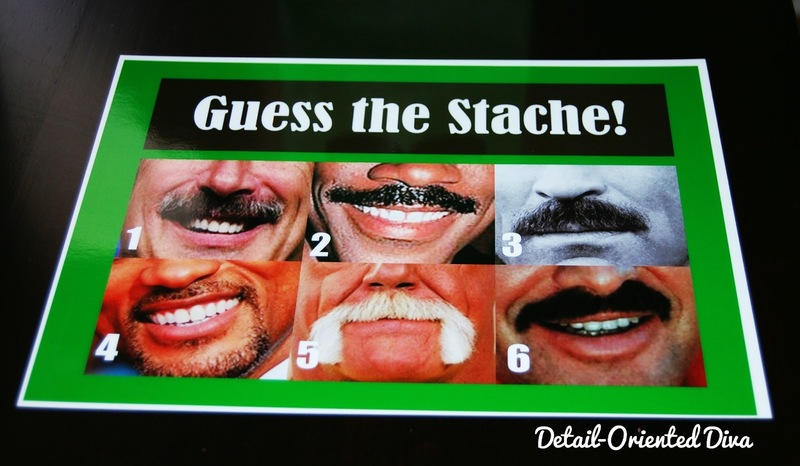 I just grabbed a bunch of pictures of famous staches from the internet. 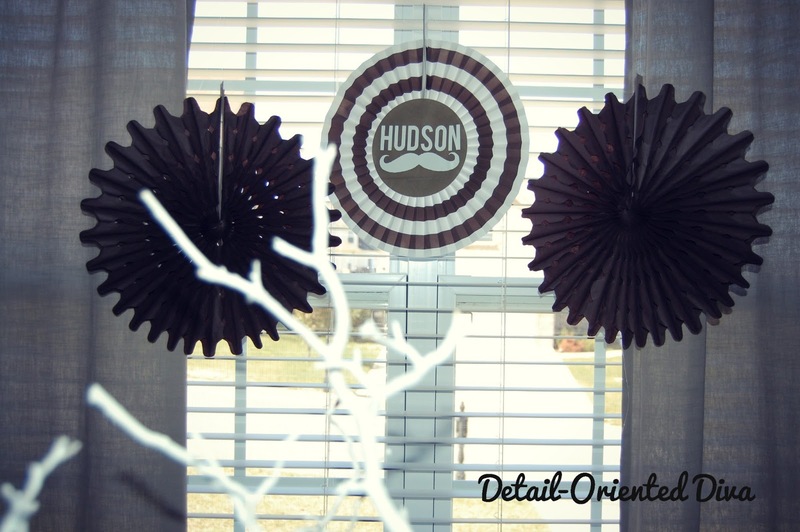 The guests really did NOT know their staches. "Guess The Baby Food" Game- The guests had to guess what each food was without tasting. I had originally planned to keep the jars closed, but the guests whined too much! LOL! This next game was by far my favorite. You mash up different candy bars and guests have to guess it. I titled it "What The Crap? ", because I just thought it sounded cooler. 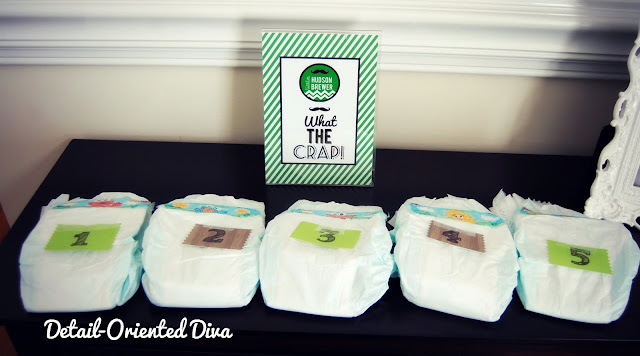 Everyone passed around the diapers and were only allowed to judge on the basis of it's looks. The Kiddo was most perplexed at why a bunch of adults were passing around "poopy" diapers. You should have seen the look on her face! So cute! 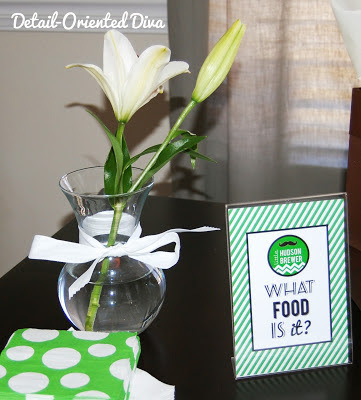 Love all the decor and games:) What a great friend! 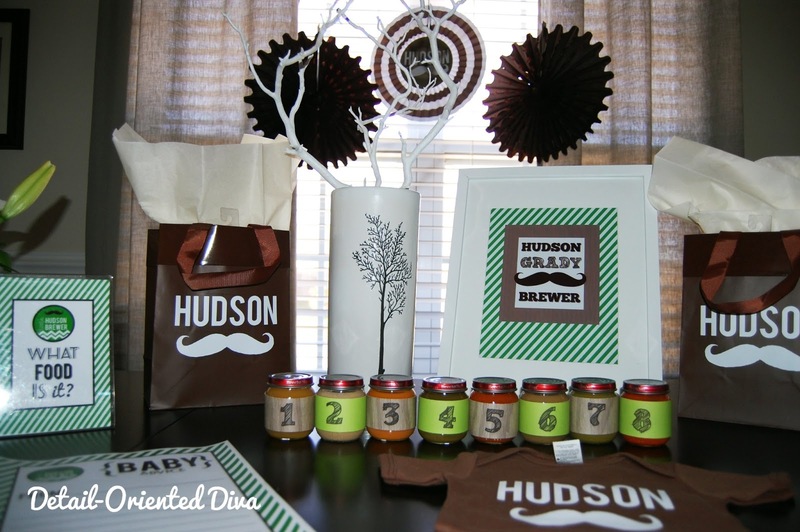 Mustache Bash Baby Shower! Each and every detail is outstanding. I am so impressed with the photos. Anyways, I also have booked the best outdoor LA venues for my sister’s mermaid themed baby shower and now just need décor inspirations. Please share if you have any.